We buy all your Military Antiques! Are you looking to sell your military antiques? Well, look no further! You've come to the right spot! We buy all kinds of German, Third Reich, Nazi, WWII items. We Buy: Daggers, Swords, Medals, Flags, Helmets, Belt Buckles, Uniforms, Documents and much much more! We strive to make it simple and easy for you to turn your items into cash fast! We work with literally hundreds of veterans and their families from all over the world every day, every year! So, if you're looking to sell your military antiques, please send us an email (paul@lakesidetrader.com ) and we will get back to you shortly. Whether it's one item or a whole collection, we would love to hear from you! Please contact us today! We strive to complete every transaction with accuracy, honesty and integrity! Please, email us at paul@lakesidetrader.com to sell your stuff! If you would like you can also call: (705) 292 0151. We will encourage you to send us some pictures by email. How can I yield a fair return for my Military Items? Every year I pay veterans, their families and estates hundreds of thousands of dollars for souvenirs brought back from the two world Wars. These are the people just like you who deserve to benefit most from the sale of these items. I've been collecting my whole life and doing internet sales for the past 13 years. Ok, so why should I sell to you? We Pay More! - I pay top dollar for veteran acquired items. In most cases I am presently paying up-to 80% of full dealer retail price for authentic German Militaria. The payout percentage is based on market forces and demand. Simplicity - I will make this a simple hassle free transaction. I have been doing this for years and have many satisfied customers. I do the work, you get fast payment. No chasing people around for money or payment plans. You get simple hassle-free service and prompt payment. I buy it all! - No need to spend hours shopping each item around to different dealers or antique shops many of which do not have the knowledge or experience I do. I will buy it all in one simple transaction. Integrity - I am honest. No one in any business can prosper long-term without integrity. I do this full-time, all the time, everyday. Would I want to risk my good name and family reputation for a quick buck? Not a chance, I am in this for the long run. This is my passion! Safety - I am a reputable business person in the business for over 12 years. I am not political in my leanings and will not sell to, or in any way support hate groups. I come to you - For large collections I travel to you! Pending prior discussion and collections of sufficient size I travel across Canada and USA! I am also in Europe at least once a year! So how do I know I'm not getting ripped off? 1 - Reputation - Look at my Feedback section . This is what my clients have said about their experience. 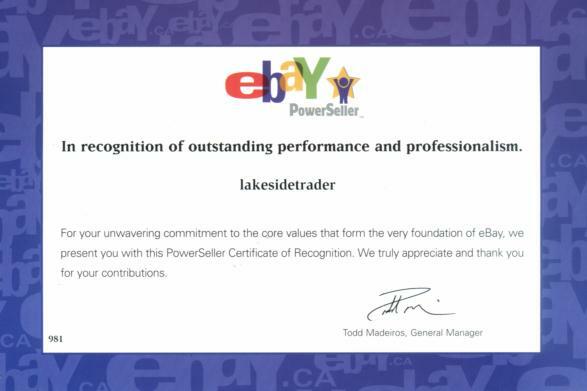 Consider my Ebay feedback where I have a proven track record having completed thousands of on-line transactions over 12 years and received the coveted "Powerseller" designation. I am a verified Paypal Business Account holder with 2000+ verified successful transactions over 10 years. All these people can't be wrong! I am a Certified MAX/GDC Dealer in good standing holding to the Code of Conduct required of me by this governing body. still not convinced? Some families are so pleased they have allowed me to use them as references. They will allow you to personally contact them to get input on their experience. Ask them yourself. I do not take this privilege lightly. If you want a reference contact me. 2 - Transparency - Watch my site and you will see your item, usually within a matter of days, come up for sale on my site reflecting the retail price I quoted you. Upon receipt of items I will be contact you within 24 hours with an offer to purchase. If you are not pleasantly surprised and accept the offer, the item will be returned to you immediately, at my own expense! Could I get more for it on Ebay? This is the second most common question I am asked. The answer is in most cases, no. Ebay was a place to sell German Militaria ten years ago. Today Ebay policy is to disallow "Items that bear symbols of the Nazis, the SS, or the KKK, including authentic German WWII memorabilia that bear such marks". Seller auctions are cancelled and more often than not the frustrated seller never sees the auction come to a successful conclusion. Repeated attempts to auction the item results in eventual suspension. Even in the few cases where auctions don't get cancelled, rarely does the seller obtain full dealer price. Local auctions are expensive with huge commissions, time consuming and rarely yield the prices I can provide to you. Ok, so how does it all work? The simplest way for everyone involved is this: Contact me either by mail, (see below for my address), phone 705 292 0151 or email me at paul@lakesidetrader.com to let me know you have items to sell. If you can include pictures that helps. I can identify and give you a rough estimate of the purchase price immediately. Simply pack the items up and send them to me at the address below. Upon receipt I will contact you within 24hrs with an offer to purchase. Most are thrilled with the offer. We then arrange to get you your money out the same day! I am flexible, if you require something different just ask and we can make arrangements that suit your requirements.